Shared from Tech Insider and BBC News. We all know Bill Nye is not shy about sharing his opinions on controversial subjects, and his views on climate change are no different. In an interview with National Geographic a couple of weeks ago he discussed a type of engineering that could have the potential to combat climate change in a major way. This entry was posted in Earth Science, Engineering, Environment, Life Science, STEM, Technology and tagged Bill Nye, Climate change, Earth Science, engineering, Environmental Science, Environmentalists, geoengineering, STEM on December 4, 2015 by Danielle Ferrante. Every great student requires a great teacher. The fields about which we have written, and the fields about which we will continue to write, all encourage students to begin taking STEM courses in high school. These STEM courses need good teachers to teach them. If learning about science, technology, engineering, and mathematics is what you want to do in college, and then you want to pass that knowledge on to future generations, consider becoming a STEM teacher. This entry was posted in STEM, Students, Teaching and tagged Education, STEM, STEM Careers, Teachers on August 31, 2015 by Celeste Beley. Robots are becoming ubiquitous in everyday life. Robots build cars, help us checkout at the grocery store, and complete millions of tasks which human beings used to do. Those who design robots must understand computer science, electrical systems, mechanical systems, and some aspects of human psychology. If you think that you can make better and more efficient robots, then perhaps pursuing a career in robotics engineering is your path. This entry was posted in Back to School, Engineering, STEM, Students, Teaching, Technology and tagged Education, engineering, Robotics, STEM, STEM Careers on August 5, 2015 by Celeste Beley. When you look at Earth from the vast reaches of space, it looks like a blue marble. In the words of Carl Sagan, from his book, Pale Blue Dot, “That’s here. That’s home. That’s us. On it everyone you love, everyone you know, everyone you ever heard of, every human being who ever was, lived out their lives.” Do you ever look up at the night sky and wonder what happens beyond the confines of this planet? This entry was posted in STEM, Students, Teaching and tagged Astronomer, Astrophysicist, Career, STEM on June 1, 2015 by Celeste Beley. The earth is our home, but it has existed for much longer than the human race. Geoscientists study the earth — its composition, its irregularities, its structure — to learn more about its history, and to tell us its secrets. Geoscientists use their knowledge of geology, physics and chemistry to study the earth. This entry was posted in Earth Science, Environment, STEM, Students and tagged Career, Geoscientist, STEM on April 29, 2015 by Celeste Beley. We’ve all enjoyed evening strolls in the park with paths lit by street lights. Can you imagine a street or path illuminated not by street lights but by trees? This far-fetched fantasy may someday become a reality with genetically modified bioluminescent plants. This entry was posted in STEM, Technology and tagged bioluminescence, environment, STEM on January 12, 2015 by Celeste Beley. How much time are the kids in your life spending on console or PC games each day? Have you told them that they are poisoning their minds? Are you right? This entry was posted in STEM, Students, Technology, Uncategorized and tagged elementary, gaming, STEM, video games on January 7, 2015 by Celeste Beley. New books may solve the world water crisis! On a hot summer day, nothing quenches your thirst more than a tall glass of ice cold water. We take for granted how clean drinking water is readily available with a turn of a spigot. Almost one billion people worldwide, however, lack access to clean drinking water. In fact, 3.4 million people die each year from water-related diseases, and 20 percent of children under the age of five in rural developing countries die from waterborne diseases. WATERisLIFE, a non-profit organization, DDB New York, an advertising agency, and Dr. Theresa Dankovich, a chemist with the University of Virginia and Carnegie Mellon University, partnered to find a cost-effective, simple method to provide clean drinking water for people in developing counties. 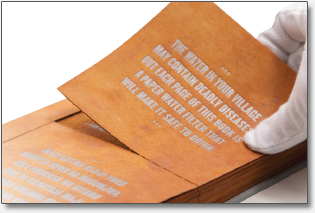 The collaborative result is The Drinkable Book, a manual that teaches safe water habits and actually produces potable water. This entry was posted in Environment, STEM, Technology and tagged environment, STEM, Technology on December 5, 2014 by Celeste Beley.